The USA is the only advanced economy that does not guarantee any paid vacation. 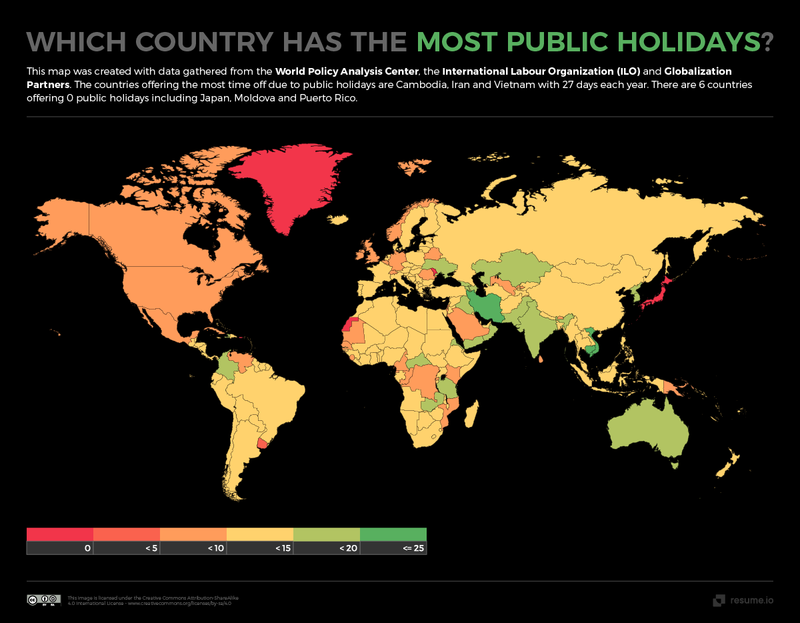 Cambodia, Iran and Vietnam have the most public holidays each year – with 27 days in total. Bahrain offers the most annual paid leave and public holidays, with 49 paid days off in total. Latvian mothers can take 658 days of paid maternity leave – more than any other country. Poland offers the most parental leave, with 1,792 days (728 paid days and 1,064 unpaid days). Men in Kazakhstan can have the most unpaid time off, with 1,116 days. Mongolia provides the most paid time off for women, at 3,061 days. Public holidays are great, aren’t they? A day where – in theory – everybody gets to take time off work at the same time, so families can get together and celebrate a religious holiday or a memorial of a historic event. It can be a time for BBQs, fireworks, presents, decorations, or, if you work in retail or the service industries, just another day of work. Leading the way here is Cambodia, which offers 27 days of paid public holidays. Workers there can enjoy paid time off for Victory Over Genocide Day, Children’s Day and International Women’s Day, as well as several days for events like the King’s Birthday and the Water Festival. Other countries with 27 public holidays include Iran and Vietnam, but with the major caveat that they’re not all paid. In Iran they celebrate holidays as diverse as Nature Day, Oil Nationalization Day and the Khordad National Uprising of 1963, but none are actually paid holidays. Which Countries Have The Most Sick Leave? Another crucial element of any job is the ability to take time off when you’re too ill to perform your tasks. Even more important is that you should be paid for this time so you aren’t losing money by being unwell. Individual companies often determine in employment contracts, but most countries have set limits for receiving statutory sick pay. Not all, however, with no federal law in the USA concerning this, although some states do require it to be offered by law. Russia and China are amongst those countries that offer the most in terms of time off with paid sick leave, both allowing it for the duration of any illness. Neither country offer time off unpaid under law, though very few countries do, with the notable exception of Canada, where it’s available for up to 476 days. Maternity Leave is the time new mothers can take off for childbirth and looking after their newborn babies before returning to work. The ability to do this without suffering a painful drop in income is particularly important at such a chaotic time of life, but there are some countries that don’t offer any paid maternity leave at all, including Australia, Suriname and Tonga. The USA offers no statutory paid maternity either, but does legislate for 84 days unpaid, while in the UK there’s the more generous 273 days paid and 91 unpaid, but new mums in Angola can rely on an incredible 588 days with some kind of income from the state while paid parental leave of up to 658 is available in Latvia. The idea that men might take time off after the birth of their child is still relatively all around the globe and that is reflected in the lack of legislation to make this possible. Many countries make no allowances, paid or unpaid for paternity leave (including the likes of Germany and China), while most of those that do only have very short paid allowances of around 14 days or, in many cases, just one or two days. Iceland and Finland both offer generous paid paternity options, while France and Spain give new fathers over 1,000 days of combined paid/unpaid leave. Which Countries Offer The Most Time Off For Men/Women? So, when you add up all of the available time off that each country allocates for its citizens, where is the best place to head if you fancy a break from work? Well, of course there’s plenty more factors to consider than just the statutory allowances for sick pay, maternity leave, etc, but for both men and women, the country that offers the most time off work is Russia. For women it adds up to 3,093 days, with men only slightly worse off with 2,953 days. The worst places for both are Western Sahara and Puerto Rico, which offer no days of leave for either men or women. Countries where there’s a big difference between what’s available for men and women include the UK, where a woman could receive 689 days in total, while a man would get less than half, with just 339 days. In some countries, the balance skews the other way, like in Iceland, where a woman could get just 268 days while a man could get 339. There are many factors at play when it comes to how we get given that much-needed time off work. As in the USA, where states fill in the gaps left by federal legislation or where companies themselves are under pressure to give their staff a better work-life balance and vacation time, sick leave and maternity leave can be part of a competitive package to attract the right staff. This means there’s no simple answer for where the best country to work is if you’re looking for a good allowance of time off, but all of the data collected in these maps will give a good indication of your legal rights if you’re working in any country in the world.